Modern mobile devices are sophisticated computing platforms, enabling people to handle phone calls, listen to music, surf the web, reply to emails, compose text messages, and much more. These devices are often stored in pockets or bags, requiring users to remove them in order to access even basic functionality. This demands a high level of attention - both cognitively and visually - and is often socially disruptive. Further, physically retrieving the device incurs a non-trivial time cost, and can constitute a significant fraction of a simple operation’s total time. To address these issues, several techniques have been implemented or proposed. Many consumer mobile devices already include one mechanism for quick, through-pocket interaction: a physical button. For example, one can use a physical switch to quickly silence an incoming phone call. Although simple, this feature is extremely valuable. However, supporting in-pocket operation using physical buttons is limiting, since one can only support a few discrete actions. In response, several research projects have sought to expand the interaction space by taking advantage of richer input channels. Of note are Tap Input and Whack Gestures. Both of these techniques support a small vocabulary of through-pocket gestures using a device’s accelerometer (directional taps and coarse whacks, respectively). An entirely different approach is to embed sensing for interaction directly into textiles. However, this requires wear-ing custom garments equipped with sensing. We developed a novel method for through-pocket interaction called PocketTouch. Our approach utilizes capacitive sensing to detect finger-strokes through fabric. 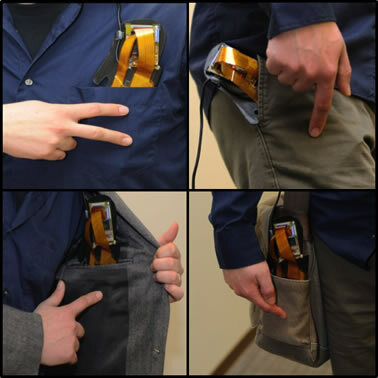 Sensing strokes through pockets enables a wide variety of interaction possibilities in situations where taking out a device is inconvenient or impossible. We demonstrate two uses of through-pocket stroke detection. First, we show that single and multi-stroke gestures can be used to issue commands to mobile devices such as “next song” or “new message.” Second, we illustrate how through-pocket strokes can be used for eyes-free text input on an enclosed device. This research was undertaken at Microsoft Research. Saponas, T. S., Harrison, C. and Benko, H. 2011. PocketTouch: Through-Pocket Capacitive Touch Input. In Proceedings of the 24th Annual ACM Symposium on User interface Software and Technology (Santa Barbara, California, October 16 - 19, 2011). UIST '11. ACM, New York, NY. 303-308.